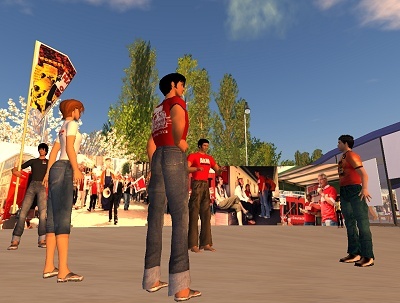 A great May Day morning in Second Life. We’ve had visitors from all over the world – from the West of the USA to the East of Mongolia, taking in Russia, South Africa, Belgium, Spain and many more. Sessions this morning included Platoon Dukes from ver.di, discussing their campaign for a German minimum wage, a pretty chaotic 101 building class, which left prim debris strewn across the sandbox, and holding it all together, our capable bar-keep Wotcher Tenk of New Unionism Network, on hand to dispense wit and wisdom, and help network people from behind the bar. 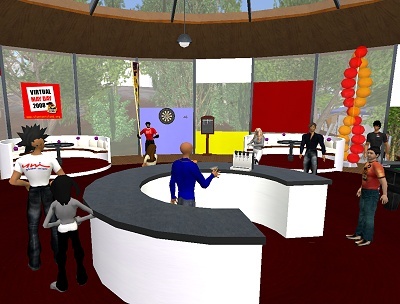 Lots more events this afternoon, so do come by and see what’s happening, with seminars, tours, discussions and parties up until 10pm GMT (2pm SLT) today.